Davis Body Shop released their Roanoke Valley Rocks fish “Gene” on Tuesday, September 18. “Gene” pays homage to Gene Davis, who established Davis Body Shop in 1966. 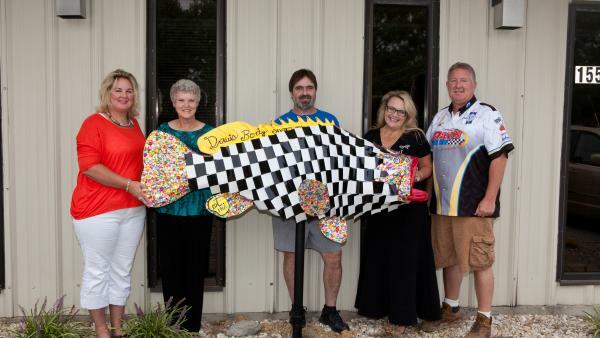 Gene the fish was designed and created by Tammy Jean of Creative Designs and Gifts (daughter of Gene Davis) with the help of Debra Shearin, who owns Mere Designs with her daughter Heather. Tammy and Debra wanted to give the fish that “get your motor running” racing look. To do so, they gave the fish scales of individually cut and glued squares of black and white aluminum, courtesy of Mike’s Quality Home Improvement. However, they also wanted to add a little color and some pizzazz in honor of Tammy and Mike Davis’s mother Ruby. They took the time to create a mask, fins and a tail completely covered in gems. The back of the fish, which can be seen reflected in the windows of Davis Body Shop, is painted in zebra stripes. This fish, which took Tammy and Debra three days working 8 to 5 to create, is truly a one-of-a-kind work of art! Davis Body Shop, a full service collision repair, paint and body shop, is currently managed by Mike Davis, Gene’s son, and Ruby Davis. Mike worked part-time early on, but came to work at Davis Body Shop full-time in 1979. Davis Body Shop goes the extra mile to ensure that their customers have a good experience. The shop offers 24-hour towing and wrecker service, free estimates for all insurance companies and a lifetime warranty on all repairs. In fact, Davis Body Shop was recently named the 2012 Best of the Roanoke Valley by the Daily Herald. Mike Davis attributes the business’ success to their wonderful customers and dedicated staff, which consists of 16 employees, most of whom have worked there for 20 years or more and are truly part of the Davis Body Shop family. “I point them in the direction, and they do the job and take great pride in their work,” said Mike Davis. Mon-Thu 7:30 a.m.-5:30 p.m., Fri 7:30 a.m-5:00 p.m.